Not Funny: Clerk Critically Injured In Hasselhoff Sign Theft : The Two-Way A relatively amusing trend in New England — the theft of Cumberland Farms advertising signs featuring actor David Hasselhoff — has turned serious. A store clerk who tried to stop two thieves fell, hit his head and is now in a hospital. What's been a relatively amusing trend in New England — the theft in the past year of more than 550 advertising signs featuring actor David Hasselhoff — isn't funny anymore. A clerk who works at a Cumberland Farms convenience store in Shelton, Conn., "remains in critical condition after falling while trying to stop an SUV from driving away with stolen David Hasselhoff signs," The Hartford Courant says. According to the Courant, "the 36-year-old man landed on his head in the store parking lot while trying to get two signs back as the alleged thieves drove away, they said. He is at Bridgeport Hospital. Police said Wednesday that a 19-year-old man has admitted involvement and is cooperating with the investigation. 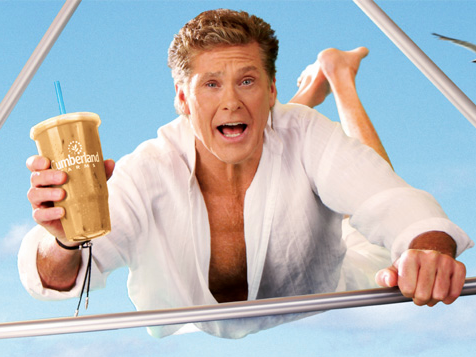 No one had been arrested as of 7:45 a.m."
The Connecticut Post reports that the Hasselhoff cutouts "play on the former Baywatch star's camp factor to promote iced coffee dubbed 'iced Hoffee.' " Thefts of the signs began last year. Update at 1:20 p.m. ET. Hasselhoff Sends His Prayers. -- "I am shocked& truly saddened about the Cumberland farms store clerk tragedy My heartfelt thoughts and prayers are with him and his family!" -- "WORDS CANNOT EXPRESS HOW I FEEL AT THIS MOMENT PLEASE TAKE A MOMENT TO SAY A PRAYER THAT HE MAKES A FULL RECOVERY!! THANK YOU...DAVID."